We’re Back from the West Coast !! We’re back from the West Coast !!!! What fun season on the coast this year. The best part was the weather. Lots of calm seas and nice weather days made for some very comfortable fishing. 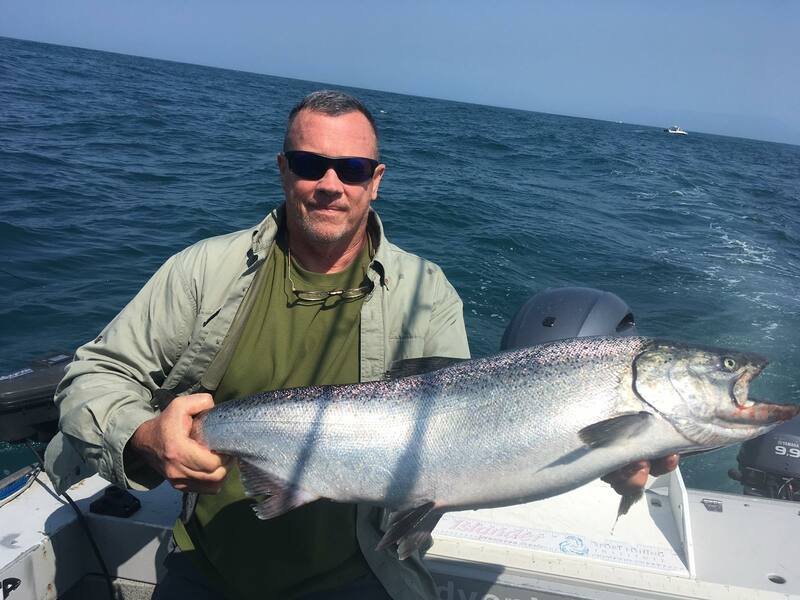 July started out a bit slow for Salmon, but the Halibut fishing made up for it. It seemed like Halibut were more plentiful this year, and were easier to catch than the Salmon at the beginning. Lots of runs out to the Big Bank this year because of the nice weather, and also because it was the only consistent place to catch fish during the early part of July. 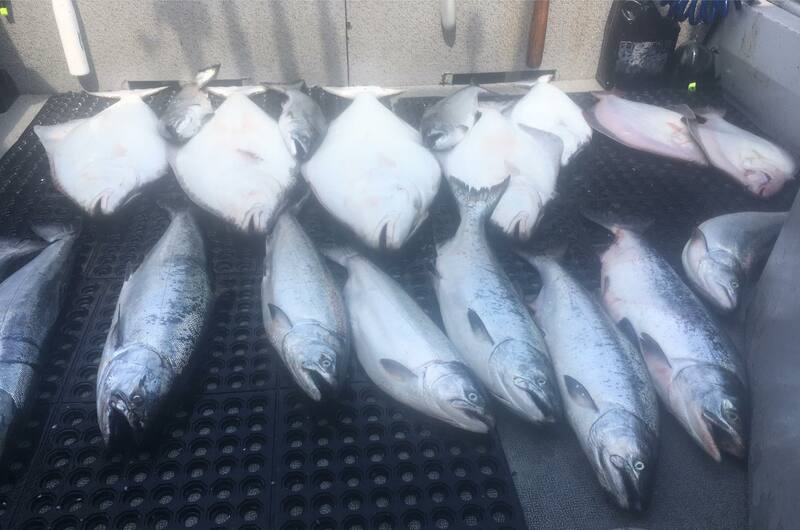 After mid July though, we started finding more big Salmon closer to home. From mid July until the end of August, there were good numbers of fish right along the beach. 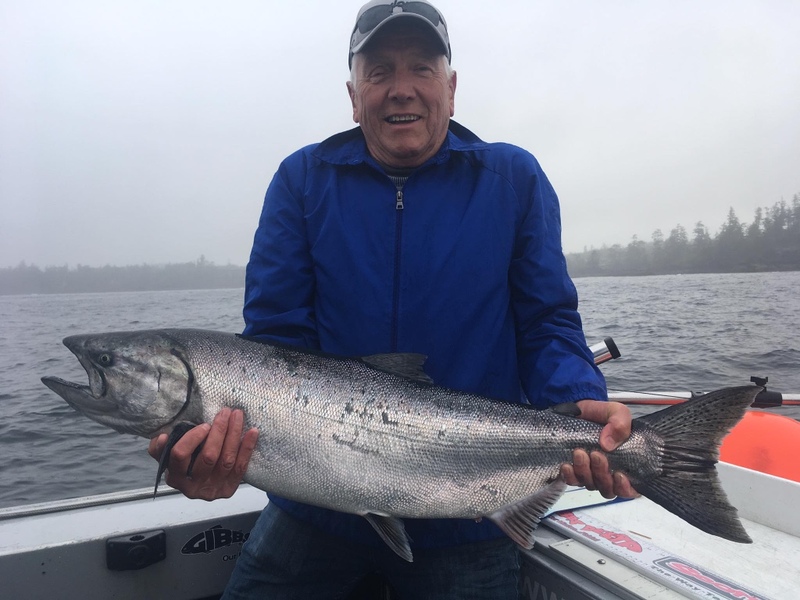 Consistent Salmon between 16 – 22 Lbs was normal along the shoreline, and as the summer progressed, we started catching some 24 – 30 Lb fish as well. 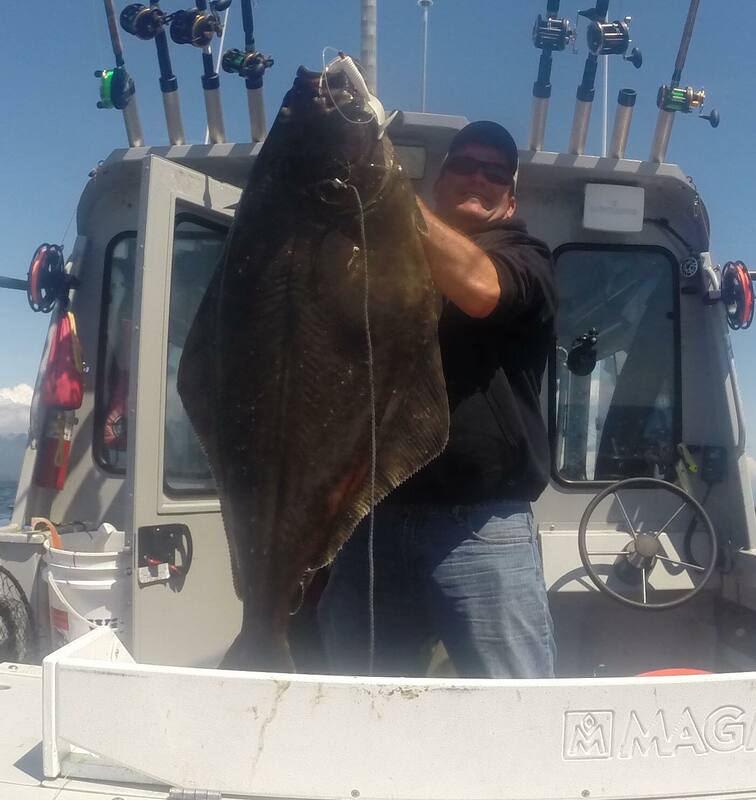 Our normal routine throughout August was to fish for Salmon close to home in the morning, and then once the crew had their limit of Salmon, we would then head offshore for Halibut. And, even when the Salmon fishing was on fire, the Halibut fishing was even hotter! I haven’t had this good of Halibut season for a long time. A nice bonus for our guests. Hali’s ranged from 15 Lbs. – 75 Lbs. Along with my local groups who travel to the coast to meet up with me, we had lots of new groups join us this year, which added to the excitement. I’d like to thank everyone who joined me this year and help make it another successful season. We added a nice new 2 bedroom cabin to our accommodations this year, which turned out to be a popular addition to our packages. And, as everyone who may have booked late this year experienced, the accommodations in Ucluelet are getting harder to find on short notice. So, I think the addition of the cabin is a bonus, and I recommend anyone interested in joining us for next season, please plan well in advance. And now, back to the Kootenays……………. Our guides kept fairly busy on the lake throughout July and August. Although the thick smoke from this terrible wildfire summer deterred some people from coming, we still managed to get out and catch some fish. Most of our trips were planned around the weather temperatures. Some early morning trips and some late afternoon/evening trips made it more comfortable for our guests as we tried to beat the heat. Our guys were catching more Bull Trout than Rainbows as the water temperatures warmed up, but now they seem to be getting a mixed bag as our nights are finally cooling things off. Rainbows between 2 – 4 Lbs were the norm, as well as Bull Trout between 3 – 8 Lbs and even a couple over 10 Lbs. As the days get cooler and the water temps are dropping, we are looking forward to spending some full days on the water. I’ll keep you posted, as we will be on the water a lot from mid September on. The river provided some great fishing throughout July and August, and is still fishing very well now. Rainbows between 2 – 5 Lbs and Walleye between 2 – 5 Lbs have been coming in lately. The crazy caddis hatch throughout the summer made for some fantastic dry fly action, and the dries continue to work right now, although different patterns are working now. Also lots of spin casting opportunities were very productive. Walleye fishing kind of tapered off during July, but has again become quite productive. We should see some good Walleye fishing throughout September and into October. Look forward to what the rest of September and October will bring us on the River. Stay tuned…………..
On the West Coast we were using mainly Gibbs/Delta Highliner flashers with an assortment of spoons. This years favourite colors were “Cookies & Cream” as well as “Maverick”. At home on Kootenay Lake, the guys were using an assortment of hockey sticks, spoons, and plugs. Most of the Bull Trout have been caught on the down riggers between 75 – 120ft. We’ve also been experimenting with the Gibbs Dogtail Dodgers on the down riggers, and they have been producing some nice fish. In fact, our biggest bull trout in the past month was a beauty 12 pounder caught on the Dogtail. And when the Rainbows decide to feed, they have been caught mostly on the surface. And finally, on the river we have been casting dry flies during the odd hatch or floating line with a nymph has worked well for the Rainbows. For spin casting, we have been bottom bouncing with a curly tail or with a worm to produce a mixture of Walleye and Rainbows. Hope this helps put fish in your boat. Or, on the bank. Just another day on the ocean..